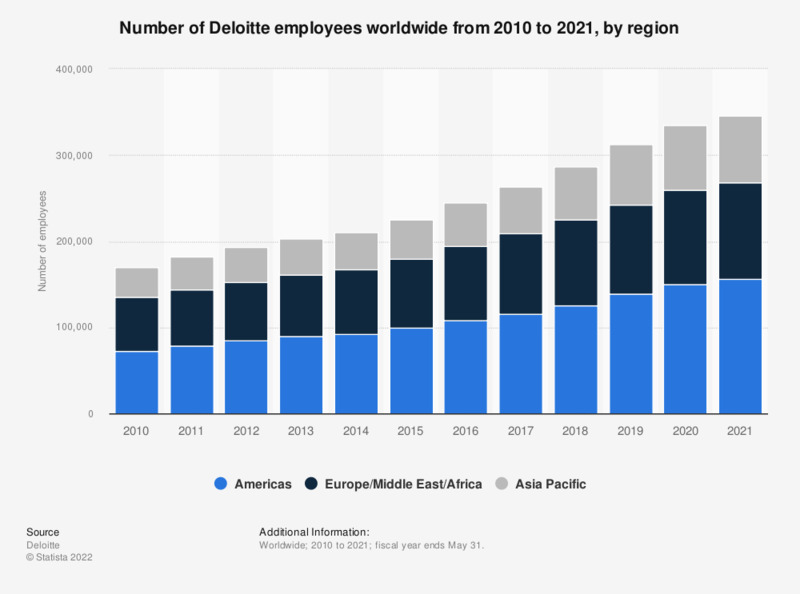 This statistic shows the number of Deloitte employees worldwide from 2010 to 2018, by region. Deloitte employed 99,493 members of staff in Europe, the Middle East and Africa in 2018. Deloitte is one of the world's four leading accountancy firms (along with PwC, E&Y, and KPMG). It is headquartered in New York City. Services are audit, consulting, financial advisory, tax, and enterprise risk. "Deloitte" means Deloitte Touche Tohmatsu Limited and its member firms. Figures for previous years were taken from previous annual reports. Everything On "Deloitte" in One Document: Edited and Divided into Handy Chapters. Including Detailed References.